Perhaps Jet Li’s finest hour, though every time I try to cement this I think of Hero, Once Upon a Time in China II, Martial Arts of Shaolin, and even the surprisingly brutal and entertaining Unleashed and the truth to that statement becomes far more “perhaps” than I’d like. That said, in terms of pure hand to hand combat, it is hard to find fight choreography that can eclipse the complexity that Yuen Wo Ping placed forth here, and alongside Jet Li, it really is the star of this movie. YWP may have eclipsed this with things like Crouching Tiger Hidden Dragon but this deserves special recognition due to the aforementioned favoring of weaponless fighting. It’s fast, brutal, complex, and everything one would want in a martial arts film. 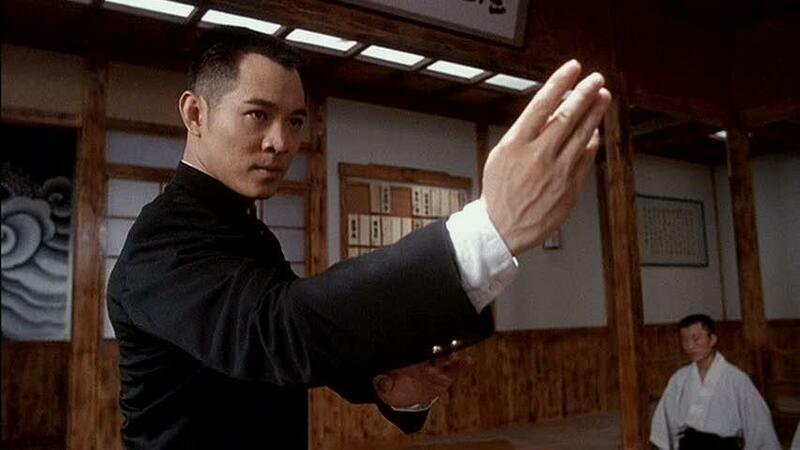 Despite being a loose remake of Bruce Lee’s “The Chinese Connection” (originally known as Fist of Fury, which became known as the Chinese Connection just to confuse the hell out of westerners), this films most close kinship is that of Wilson Yip’s “Ip Man” films. The films all take place during the Sino-Japanese war and deal with the dynamic of Japan’s abuses inspiring a martial arts master to stand up and represent all of China. Both (oh so mild spoiler) build up to a climactic battle with a Japanese general. Ip Man benefits from modern effects (FOL has some obvious speed ramping), a modern budget which brings higher production values, better cinematography, and more willingness to depict the ruthlessness that the Japanese displayed during the conflict. Yet, even so, I feel Fist of Legend is the superior film. Despite not displaying the barbarism the Japanese unleashed on the Chinese, the film does not lack in recognizing that it happens but also gains strength in making a point to contain Japanese characters that are not purely villainous. This leads to a better representation of a national conflict and dampens the pure propaganda nature these films contain. It also benefits from a climax that actually contains stakes and feels appropriately epic for what came before, where as Ip Man more or less collapsed under it’s own weight and feels too anticlimactic. The real strength that gives this one the edge is the aforementioned fighting and Li. They tower over any of Ip Man’s virtues. If you want a good martial arts film that represents to dawn of the modern age in the genre, this just may be the apex. This entry was posted in Action, Drama. Bookmark the permalink.